Great seller Fast shipping Thank you ! What a great way to package a full sized cut out. I was able to assemble it in seconds without even looking at the instructions. It was a great hit at my party. Trump supporters loved it, while Trump haters showed their true colors and were 'triggered". Cardboard yes..... glossy movie poster quality no. If your expecting to get a glossy movie style quality poster you should pass on this...matte finish and dull colors. 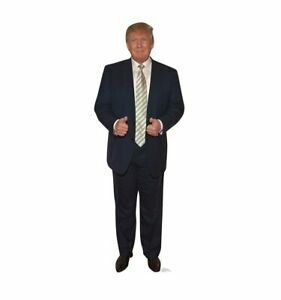 Make life size cardboard cutout standup's great again! i took a selfie once with a cardboard cutout of Trump at a local souvenir shop--this cutout is exactly the same! it's tall, like Trump, and has a sturdy cardboard set-up in the back that keeps him from folding in half like he was during shipment. My only suggestion would be to put him somewhere safe from little kids or heavy traffic in the home and notify everyone that Trump is in the house so he doesn't get hurt when unsuspecting relatives think he's an intruder. Getting this for my friend's birthday present! I KNOW he doesn't already have something like this. Thanks!